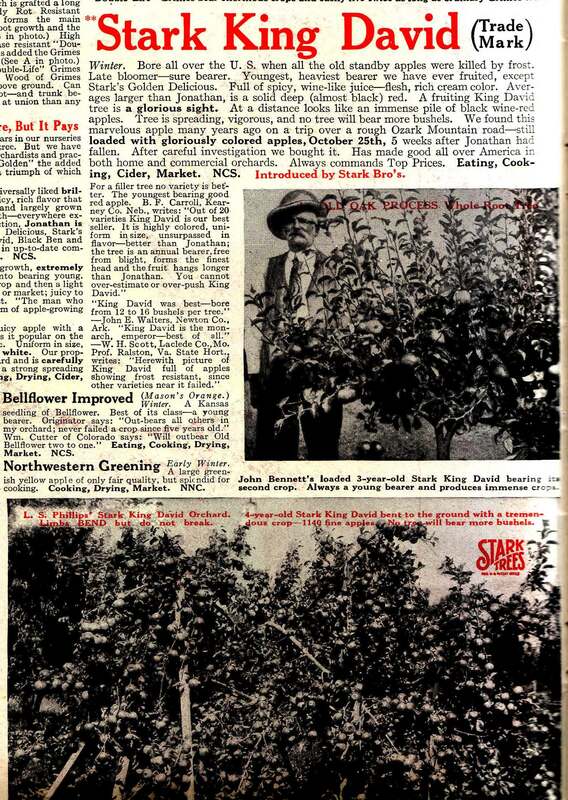 This is a page out of the 1924 Stark Bros. Nursery Catalog extolling the virtues of King David apple. Stark Bros. is the same nursery that introduced the smash hits Red Delicious and Golden Delicious, so they know a thing or two about apples. We had actually found King David growing at an abandoned orchard up in the mountains, but didn’t know what it was; by the way, that’s King David on the blog mast head. I grafted cuttings down at my house and grew it out, and discovered it was exceptional down here with a deep, rich, winey taste that ripens in November. Because of the color we thought it was Arkansas Black at first, but the flavor was much better; I suspected it to be a seedling for a bit, until I put pieces of the puzzle together and hit on King David, a favorite of several Oak Glen growers. 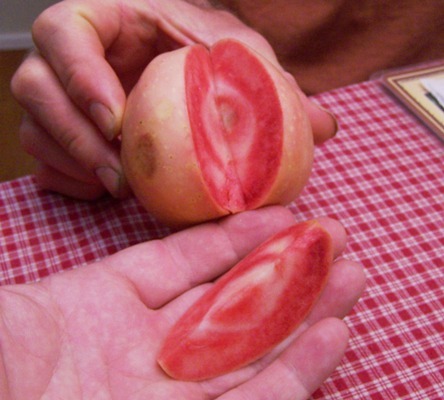 It is my favorite also, and usually any one who tries a truly ripe one will agree. With a name like King David it should be grown in Israel, and the Israeli nurseryman I sent photos and description to agreed and is applying for the import permit necessary to introduce it into quarantine and virus indexing. I don’t think CM Stark thought of that when he named it, but it fits never the less. 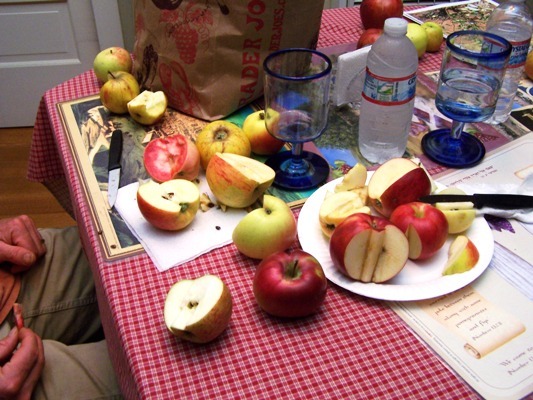 This is the debris from the apple tasting this evening where my friend Axel from Santa Cruz brought down about a dozen late summer varieties he grows. The flavors ranged from sweet to tart, anise and licorice to cinnamon and spice. It was interesting to compare our tastes, with him preferring sweet and honeyed while I prefer tart and spicy, which is all OK; there are plenty of apple varieties that every person can have their own favorite apple. 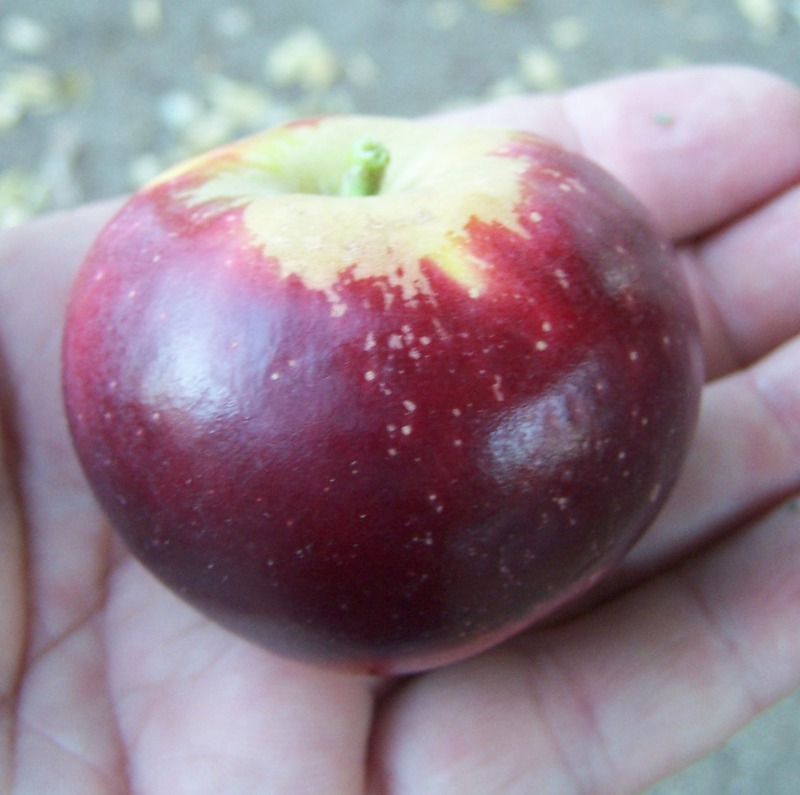 One of the varieties was Pink Pearl, a red-fleshed apple. I had always heard red-fleshed apples were on the tart side and just a gimmick, but this one was quite decent, sweet and spicy. You wonder if your eyes are fooling you into thinking you taste a hint of berry, but we both agreed that we did indeed taste either strawberry or raspberry. Our climates couldn’t be more different; he’s in the mountains with very cool, foggy summers and comes down here to warm up a bit. We’re sick of the heat and wouldn’t mind cooling off for a while; what grows up there may not necessarily do well down here. But that doesn’t stop us from exchanging scionwood every winter to grow out different varieties to see what happens; I may try Pink Pearl this year just to see what happens. Thanks for the visit and apples Axel! My friend Damian in Australia asked if I had any photos of a full tree in the orchard in Zambia, and thus this post. Notice the ingenious use of rocks as limb-spreaders. Soon this tree will have limbs heavy with apples, and so they should be trimming the lower branches off up about 60cm so that they;re not drooping on the ground. 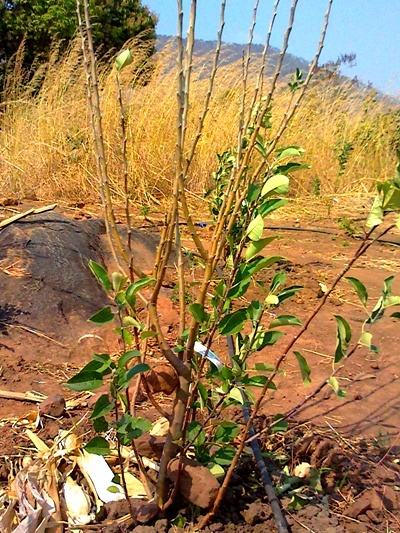 Not being ones to waste anyting, these trimmed-off limbs can be used for grafting onto other rootstocks (possibly started from seed from the apples harvested this year), as limb-spreaders, or as stakes for tying the other limbs in a more horizontal fashion to develop strong crotch angles. This tree has a nice trunk girth on it and is doing well; note the drip tubing, advanced for this part of Africa. 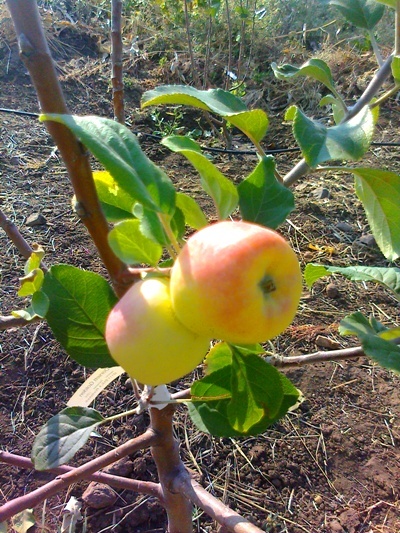 As far as we know these are the first apples grown in Zambia. They are the second crop this year from the Anna tree, and are typical for the fall crop; smaller, highly-colored, and highly flavored. You can already see the blossoms of next spring’s crop, as each bud on that fat branch are flower buds. If they thin them heavily the spring crop will consist of absolutely humongous apples. Anna is best pollinized by this beauty, Dorsett Golden, which is a great apple in its own right, and can also get humongous if thinned properly. They will both fruit reliably year after year. They do not keep well and bruise easily, so the best way to preserve them is to slice and dry them; they make tasty snacks and when cooked into pie they are indistinguishable from fresh apple slices. 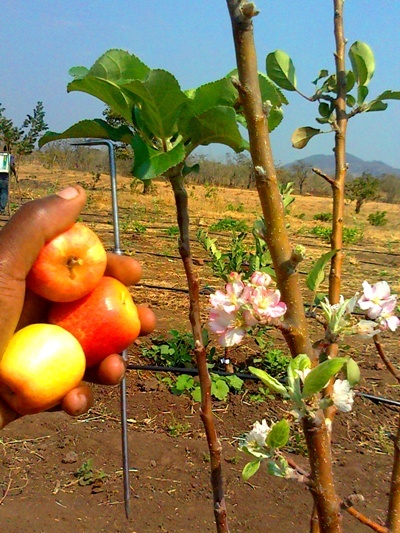 This farm is well-tended and promises to bring apple production to Zambia; we’re happy to be a part of it.